You have added Free-Spirited Glamour Sequin and Embroidered Dress in Beige into shopping cart. Add a touch of shimmer to your laid-back bohemian style with this embellished dress. The Free-Spirited Glamour Sequin and Embroidered Dress is made of a gauzy cotton-blend fabric. It is lined at the bust but the skirt is unlined and you may want to wear a slip or cami underneath for more coverage. 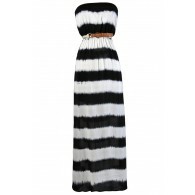 This dress has a subtle V neckline, adjustable spaghetti straps, and an empire waist. The bust is embellished with gold beading, sequins, and metallic embroidered designs. Crochet lace trims the bust, adding to the laid-back vibe. A hidden side zipper completes this dress. The Free-Spirited Glamour Sequin and Embroidered Dress is a cute summer dress that is casual with a touch of flash. This is a nice dress to pack on vacation, and it could even work as a cover-up over swimwear. Wear it with neutral wedges to dress it up a bit or dress it down with flat beaded sandals. Details: Lined at bust. Adjustable spaghetti straps. Hidden side zipper. 60% cotton, 40% polyester. Lining: 100% polyester. Hand wash cold water separately. Color will bleed. No bleach. Hang to dry. Small measurements: Length from top of bust to hemline: 27". Bust: 31". You have added Free-Spirited Glamour Sequin and Embroidered Dress in Beige into Wishlist. You have added Free-Spirited Glamour Sequin and Embroidered Dress in Beige for Stock Notification. 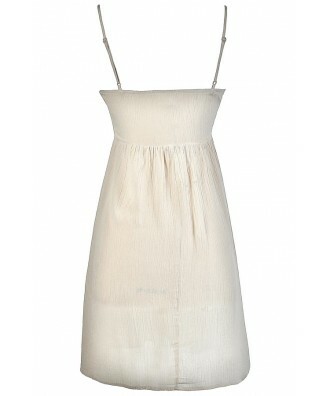 You have set Free-Spirited Glamour Sequin and Embroidered Dress in Beige as a loved product. 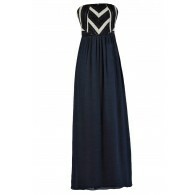 You have removed Free-Spirited Glamour Sequin and Embroidered Dress in Beige as a loved product.